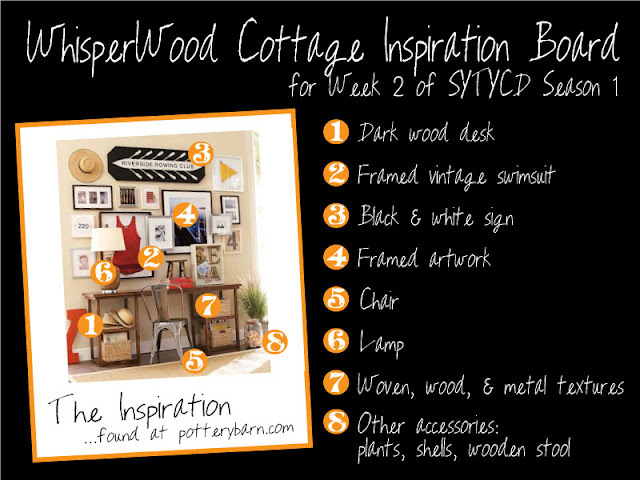 This week's project theme is "Catalog-Inspired." 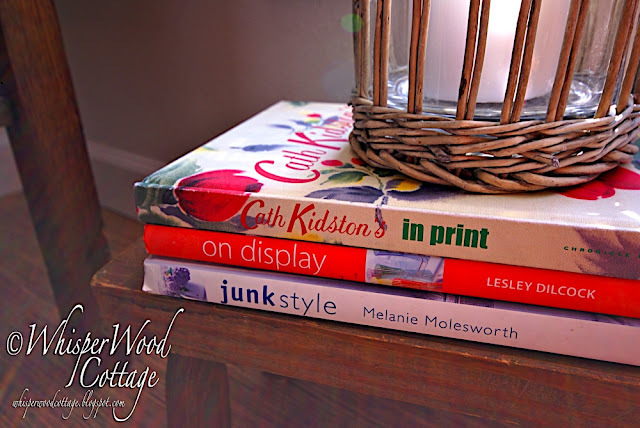 What I especially love about catalogs is their expert styling. 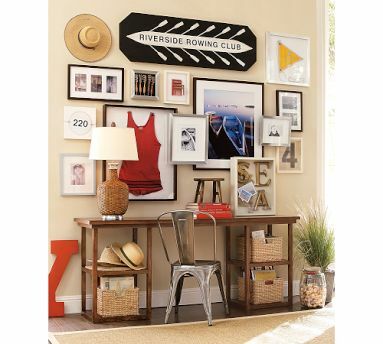 That was the approach I took this week as I used this inspiration photo below from PotteryBarn.com to style a small, corner workspace area. Section 1: Entry as posted on So You Think You Can Decorate. Section 2: Additional photos...'cuz you know I can't take only 5! Section 3: How to view the other entries and cast your votes. Oh, inspiration! The best thing about catalogs is that they know how to create such fabulous vignettes. But what do you do when you don't have the exact furniture, the exact accessories, the exact colors, and/or the exact style? You work with what you do have!! It's not about copying the inspiration. It is about being inspired by it and creating a space that is definitively your style. PHASE 1: Clearing the space. 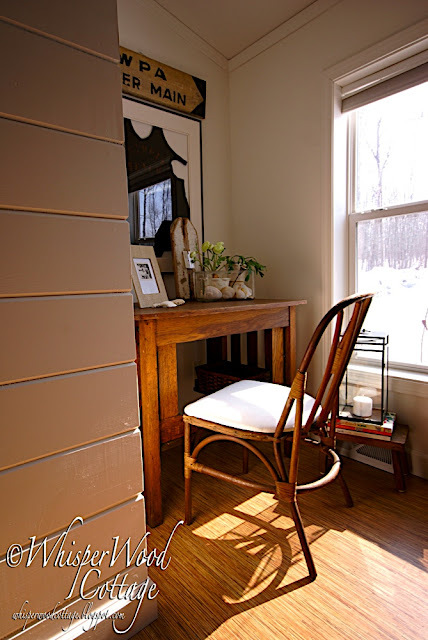 The existing neutral walls and the dark brown desk fit with the inspiration room. Everything else that was in this space was cleared out. PHASE 2: Adding key accessories. 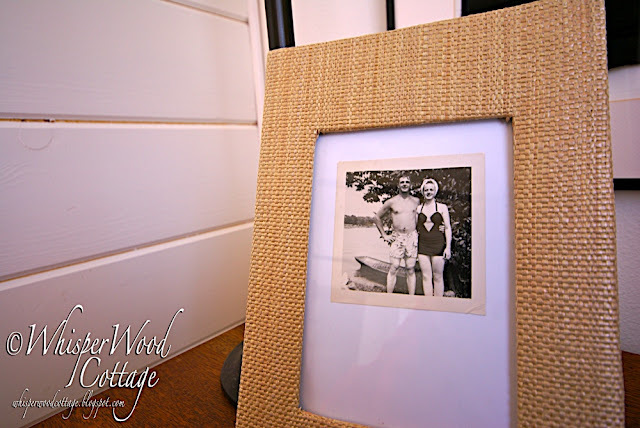 I started by adding the key accessory pieces that drew me to the inspiration photo: the framed vintage swimsuit and the sign. As often as possible, I like to use authentic pieces with character and history. Luckily, I was able to add some here. 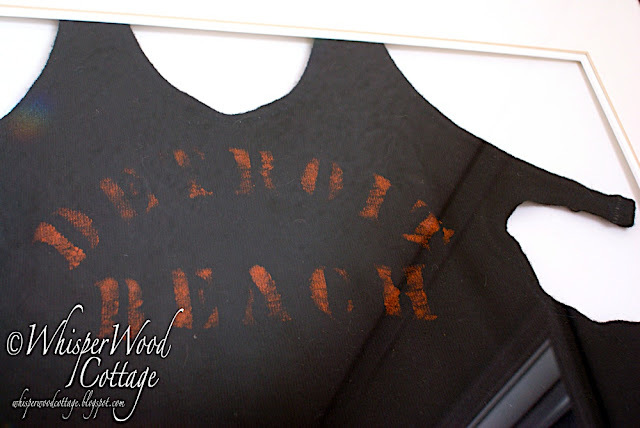 In my version of the framed vintage swimsuit, the swimsuit is a man's size 40 black wool suit that has "Detroit Beach" printed across the chest in orange letters. I found it at an estate sale last summer. Imagine a muscle-bound lifeguard strutting across the beach during the 1920s! The swimsuit is framed in a $1.99 Goodwill find. 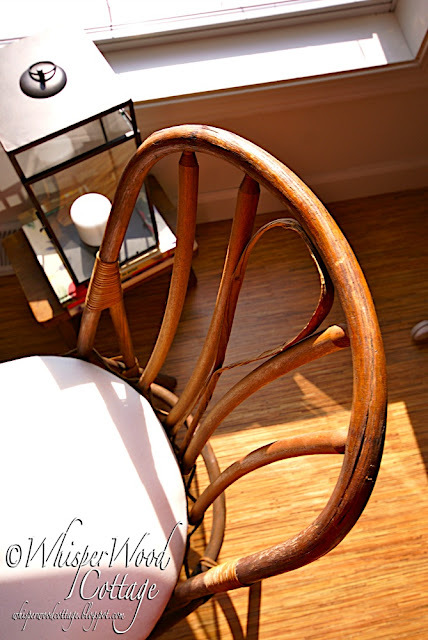 A simple sanding and coat of black paint covered the once brass finish on the frame. 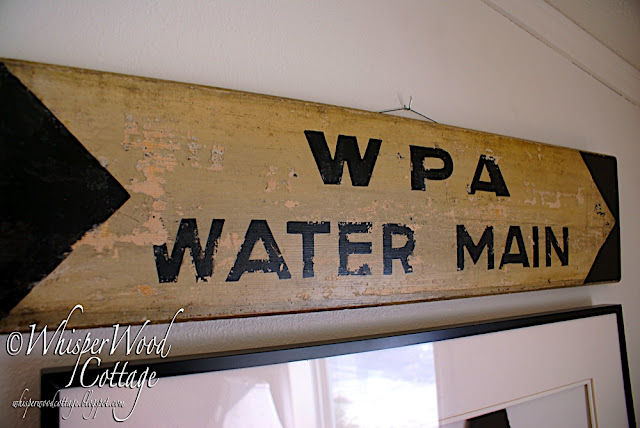 While I didn't have a rowing sign, I did have a black and white water-themed sign that says "WPA Water Main." WPA stands for the Works Progress Administration, which was an organization started by President Roosevelt in 1935. It employed nearly 8 million workers in the U.S. as it rebounded from the Great Depression. PHASE 3: Adding supporting accessories. 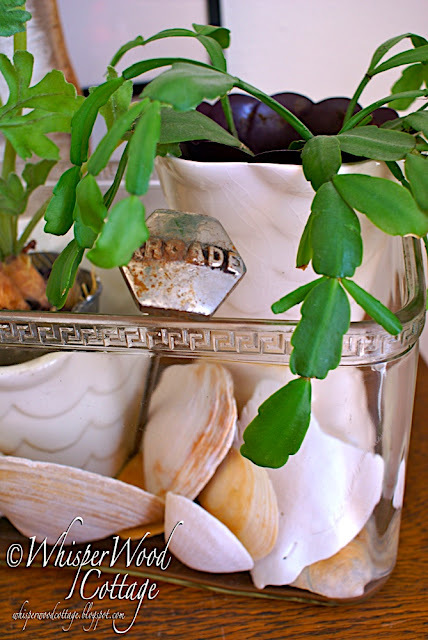 To finish off the space, I started with this buoy, a garage sale find from last summer. 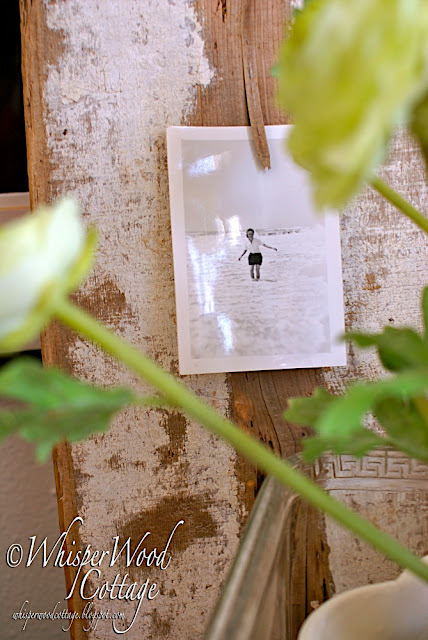 A loose piece of wood became the perfect "clip" to hold a black-and-white photo of my grandmother in Lake Michigan many years ago. While this unique "frame" echoes the framed artwork in the inspiration photo, it is a fun interpretation that makes it uniquely my style. 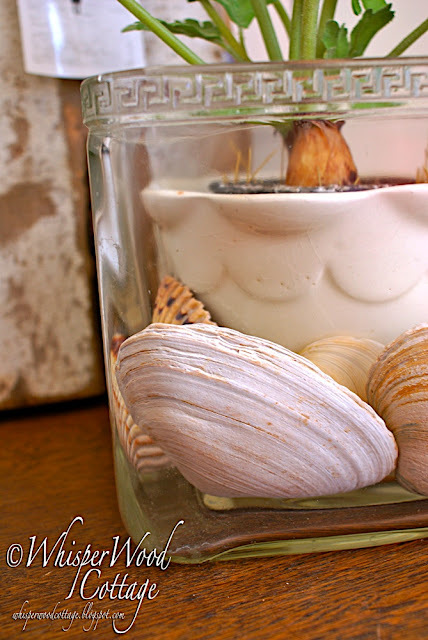 This battery jar, plant, and seashell display is my interpretation of the plant and jar of shells on the floor in the inspiration photo. For an additional punch of personality, a vintage Arcade ice pick gets added to the mix. The metal finish of the ice pick relates to the chair found in the inspiration photo. With the addition of a lamp, a framed photo in a natural frame, a wooden stool, some books, a chair, and a lantern, I was all done. I hope you enjoyed my interpretation and twist on the catalog inspiration photo. Are you feeling inspired by all the SYTYCD projects? I hope so! Now, go out, be inspired, and inspire others!! 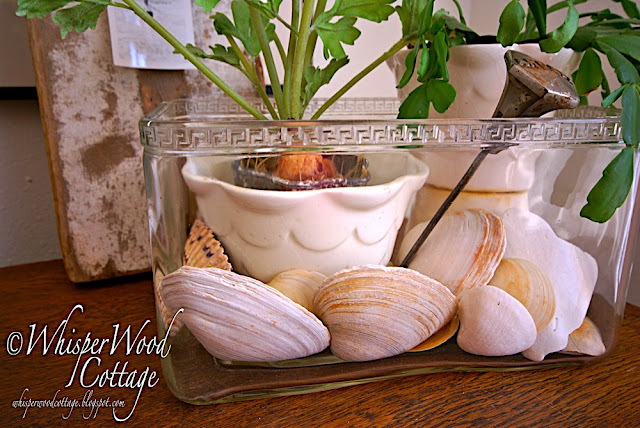 Visit my extended post for more photos at WhisperWood Cottage! CAST YOUR VOTE AT SYTYCD! Voting polls for Week 2 are open through Friday, March 12. Voting open to everyone....bloggers and non-bloggers alike. Your interpretaion is beautiful. So much better than the original. On my way to vote. Great job, Amy!!! I love it. Looks really, really good. My favorite thing is the lamp. I love the vintage swimwuit and the water main sign. You are so good and putting interesting things together. Love it! This looks wonderful. You did a great job! I love that framed swimsuit. Isn't it amazing what can be put on the walls? 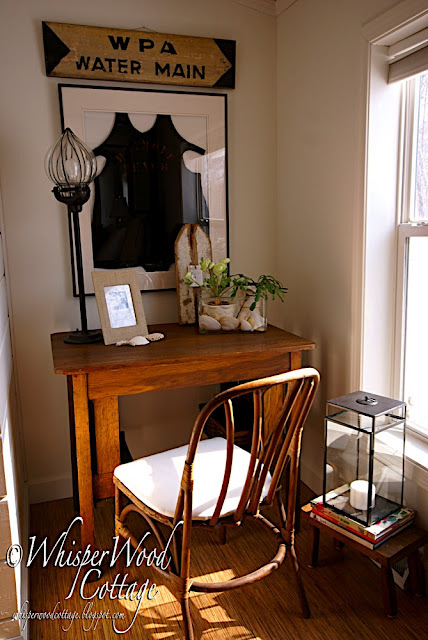 love this little space! it's so cozy & inviting! Beautiful! 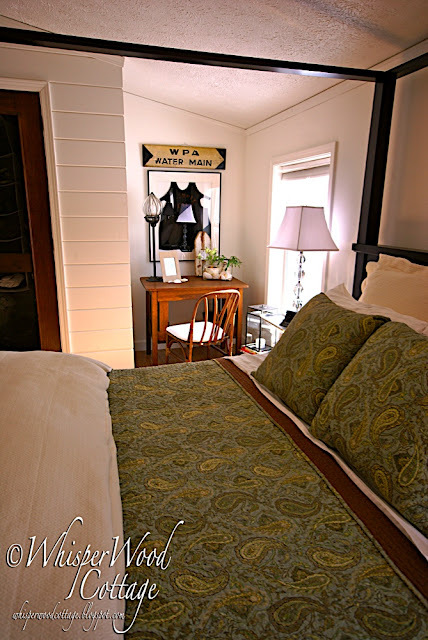 Where did you get those fabulous bed linens? This room is magazine worthy! Fabulous post, and as always, your pictures make me feel like I'm there! Thanks for sharing YOUR inspiration in the Project Parade. absolutely beautiful!! 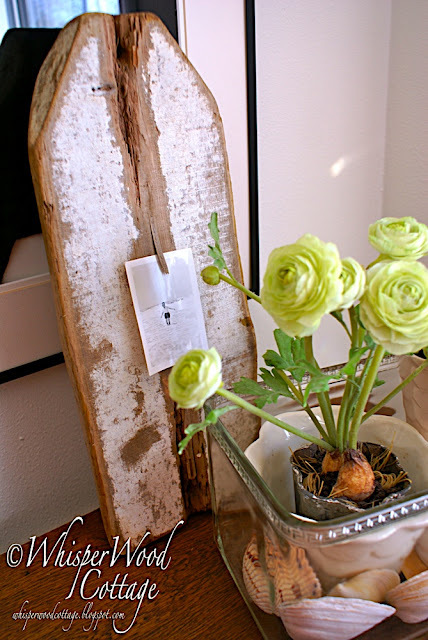 So inspiring to see you recreate that look in your own home! So happy I found you through DIY showoff! You started with great stuff, all perfect for the inspiration photo. Love the results. This is great! Love the sign and the vintage swimsuit! So cool!! Everything looks fabulous! I love your PB inspired space so much more than the inspiration pic! All of the wonderful accents you used make me want to sit down at that desk and write out a few vintage postcards to send to friends! Great job! I like yours better than the original, as it had too much stuff for me, it is so busy that it draws the eye all over the place without stopping. Yours is more grounded and serene in a way. Very nicely done -- and you definitely have the right idea about not copying, just being inspired. You did an amazing job...love the sign and the men's swimsuit. Sooo sweet and warm! I found you from Make it for Monday. I am your newest follower!!! I can't wait to see what you do next! WOW! Very, very nice job. I love all the water related items. All amazing finds that you put together wonderfully. Love it! 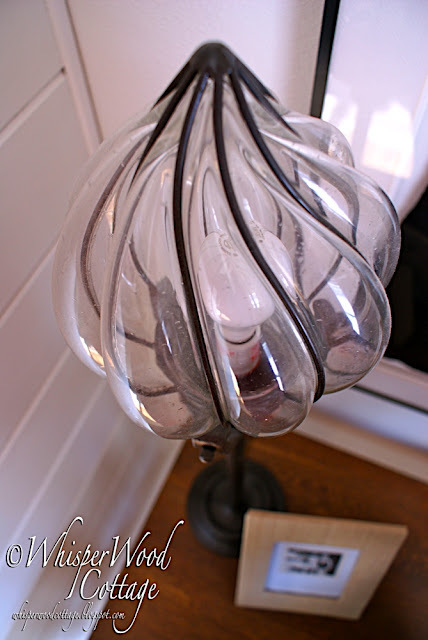 That lamp is stunning. Your style is fantastic. Great job! Great use of that niche. What a great eye you have. I love that little nook! And how wonderful that you took us right by the hand and showed us how you translated your inspiration. I will come back to this post! your site...takes my breath away! oh...and the DETROIT BEACH suit...hello! i live by detroit lake?! i think i really must come and see you! :) well done..i love your blog! hey girl - gorgeous results! I love how we get to be inspired by something & create something similar but altogether different & unique. Lovely! p.s. just saw your new back corner room at old towne - rockin!! so glad you're downstairs!! Beautiful! I love every little detail. thanks for linking up! Good luck, I'm off to vote! I love this! 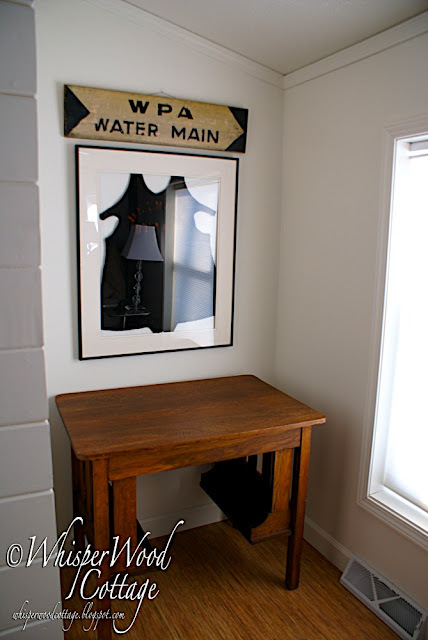 That chair is amazing and I would love the WPA sign to mysteriouly appear in my living room. I love how everything relates and works together, but doesn't "match." Great job! Amy, yours is better, as it shows some restraint. I think the PB one is a little excessive (although, I have been lusting after aluminum chairs like that for some time!). 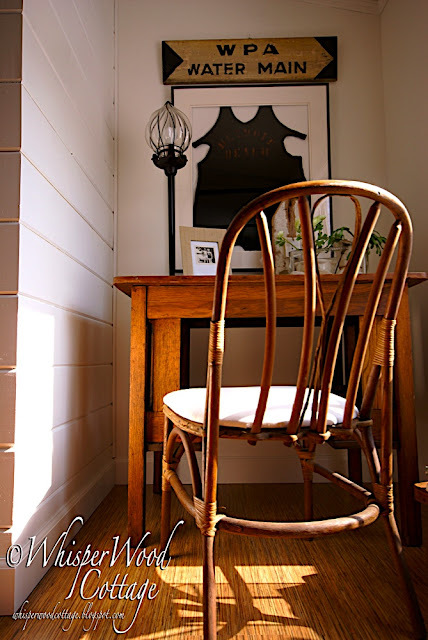 Great job, as always, and what a perfect little nook! Brilliant interpretation. I love your personal twist. I've voted of course. Just between you and me...I think you've got such great style...it's easy to vote for you! Very nice and creative interpretation. Your grandmother in Lake Michigan was a nice touch. That is an amazing interpretation. The buoy with the photo is my favorite. Good luck! What a fun contest! Well, you have just blown me out of the water with this amazing project. I. LOVE. IT. I love the water main sign. I love, love, love real vintage signs, not repros. I love your interpretation on this area. The special little touches really make it the best. My favorite is the picture you have clipped to the wood and the arcade puck nestled in among other treasures. Now, my question is how do we know what is to be the theme for NEXT week? I love it! You did such an amazing job. Good luck with the contest! I like youy display better than PB's. I think theres was too cluttered. Your corner looks really wonderful!! I really love your entry this week. All of your photos look straight out of a PB catalog - and that's a good thing! Very PB style!! Looks great! You take GREAT pictures! Lovely, warm, sweet. I see another of your commenters asked about your bedding - I'd love to know where you go them as well. I've been looking for something of similar style with no luck.